Surprise! I knit an entire sweater over a 24 hour period. Yup. 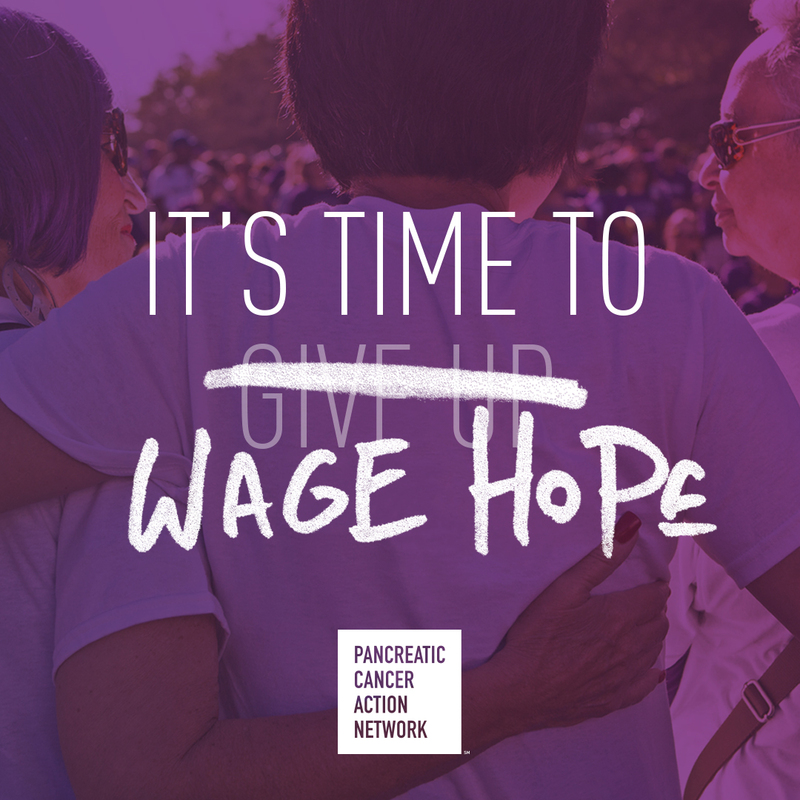 I did that – and you can too! Meet the Malmo sweater, one I’ve wanted to make for a while. So how did I end up ditching my plans to finish the body of my Balloon Cardigan and knitting an entire sweater between Friday night and Saturday afternoon? On Friday I was running errands and while I grabbed lunch I saw Fibre Space posted on Instagram that they were having a winter sale and that Berroco Macro was 50% off. I was down the street from the yarn shop so I drove right on over. 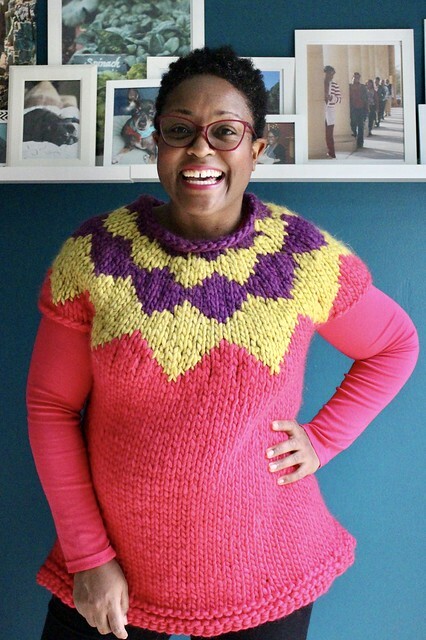 I’d had this fun super bulky pattern for the Malmo sweater in my favorites since it came out but couldn’t justify the cost of the yarn but at 50% off I could. I also knew my color choices would be limited to what they had in stock so I went with what they had and I picked purple, yellow and pink for a fun combo. I bought more than what I needed (I may make a super bulky brioche scarf with the leftovers) because when I just did two colors for the colorwork I only needed 1 skein for each color and 3 skeins for the body. And I love this pink, it is so vibrant and gorgeous AND I had a hot pink tee in my wardrobe already that was a spot on match. I started knitting around 5:30pm on Friday night and got about this far by 10pm. When I picked it back up around 9:30am the next morning I knew it would be smooth sailing since it was just the body left to knit. Also, I love floats on colorwork almost as much as I love the right side of the pattern. This is knit top down, the colorwork pattern is super simple and I knit it with size 15 needles. Large needles don’t bother my hands like some people have said, it’s the tiny needles that cramp my hands so I’m happy to knit with super bulky yarns. It was such a super satisfying knit to finish a sweater by 4pm the day after you cast on. Also I love short sleeved knits for layering. I live in Maryland, not Maine, so when something is a really wooly warm wool I don’t want full sleeves. I’ll only get to wear it once or twice. Now I can totally wear this before spring has sprung. This is a super soft blend of wool, alpaca and acrylic. So I’ve knit a sweater up in under 12 hours, this is definitely a record (remember, I knit this one in 48 hours in December), so have I convinced anyone else to give this pattern a go? You can knit it with any super bulky you like and I highly suggest you give it a go this long weekend coming up! 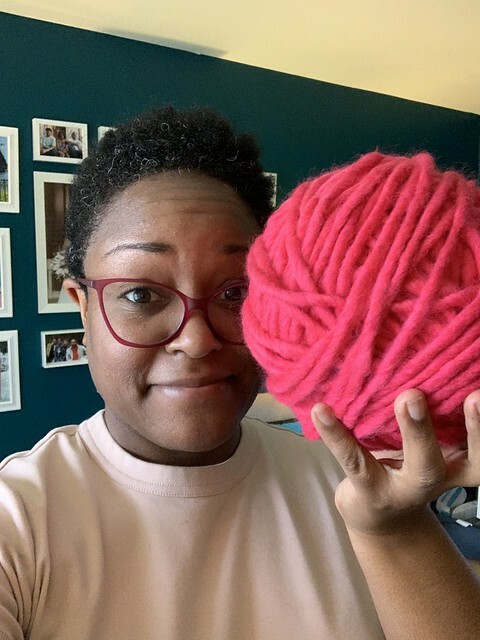 I hate to say it, as I’ve said it before….but you knit SUPER fast, lol. That is a bright and beautiful sweater. 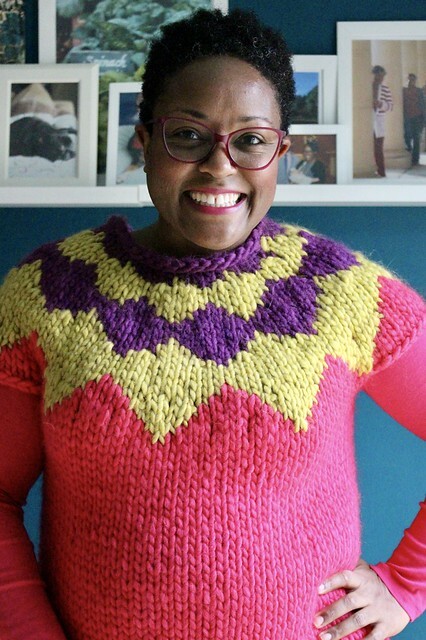 If I still lived in PA, instead of eastern NC, I would totally knit that sweater…..hmmmm, maybe a worsted version someday? I think Knit Picks makes a cotton bulky yarn, that could be a possibility! Ooohh….that could work! We were in the high 70s most of last week. The weather here is amazing! Knit on!! Love this, and the pink is awesome! Wow, that’s amazing! 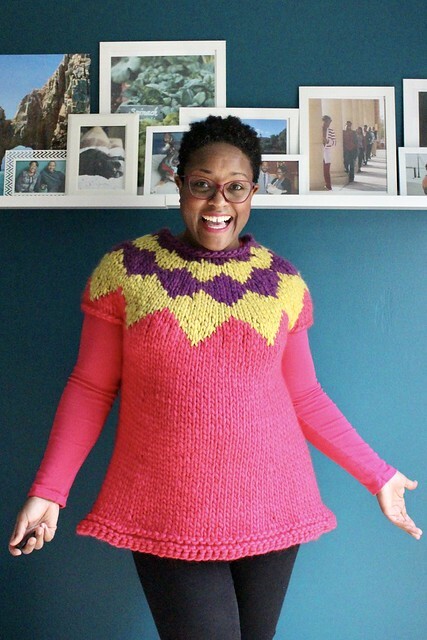 You’ve inspired me to get my super bulky yarn out and cast on a top down sweater – I’ve always been concerned that it might look too chunky but i think leaving the sleeves short like you have done will sort it out! Thanks for sharing such a great project! SOLD!!! It looks great and I am convinced that this would be the perfect tunic accompaniment to my newest pair of leggings! 🙂 Way to go, DWJ . . .24 hours!!! I would love this as a dress just a bit longer than the tunic length on the project! So cute and the colors look fantastic on you! I thought about doing another zig zag on the lower body! I think you can do it. Love that flippy silhouette! I’ve always found knitting bulky weights to be hard on my hands. Do you keep the tension really loose? Love this look… Am so interested in the short-sleeved bulky sweater idea. This looks fabulous on you – congrats on setting a new record. Knit on…..
Sold! I just bought the pattern. As always, you rock the sweaters! I love this! 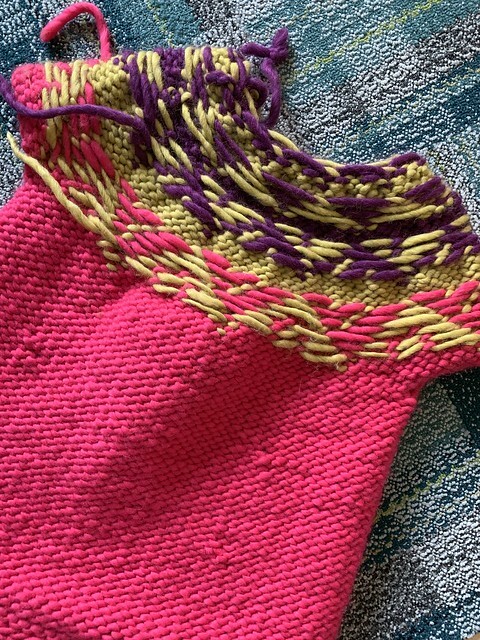 I want to do sweaters but I’ve been dragging my feet because I know it will be a time intensive project – now I want to do something with bulky yarn! The colors are so vibrant and lovely! Wow! 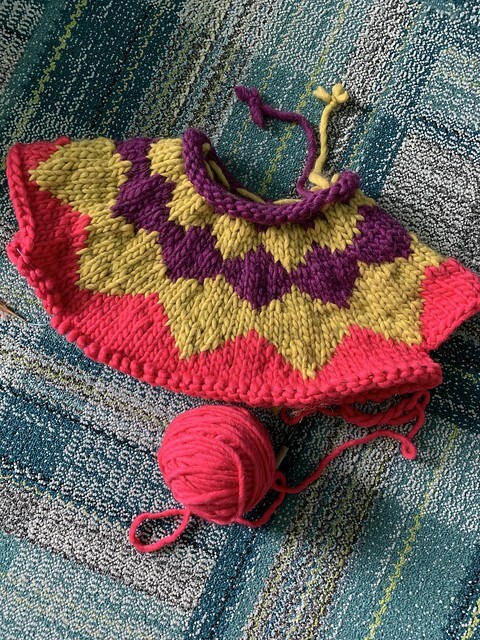 Quick knit, and it looks wonderful on you – so bright and cheerful! And what a great deal – awesome knit all around! WOW I thought you knitted fast, but I’m convinced. That’s really a cute sweater and look great. It would be nice to live somewhere it’s cold, to have a reason to knit sweaters. Great, bright colors. Hi… l just read about you in MDK! You’re amazing! #weknittoo. Beautiful sweaters! Inspiring!